On April 5, 2016, The Ohio Speech and Hearing Governmental Affairs Coalition (OSHGAC) held their Legislative Reception at the State House Atrium in Columbus, Ohio. OSHGAC, founded in 1982, is a coalition of Ohio speech and hearing professional organizations including the Ohio Academy of Audiology, the Ohio Council of Speech and Hearing Administrators, the Ohio Speech Language Hearing Association and the Ohio School Speech Pathology Educational Audiology Coalition. The evening reception continues to be well attended by colleagues and members of the General Assembly. 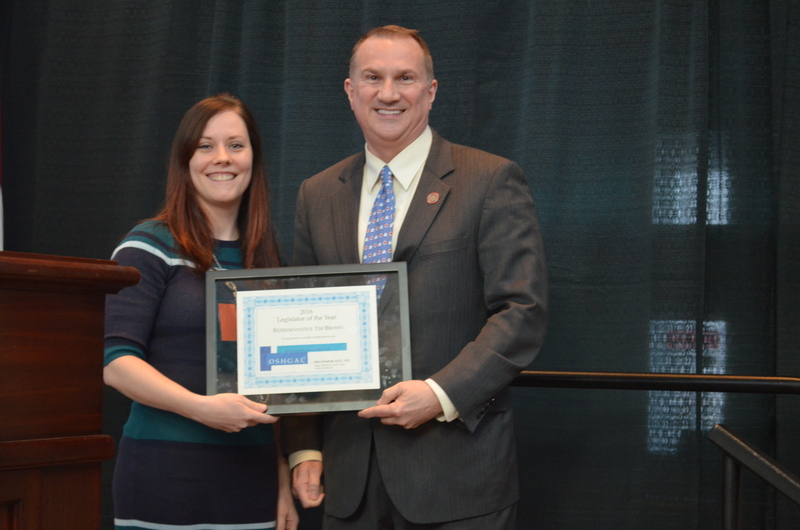 The legislative reception also provides an opportunity for OSHGAC to recognize a legislator who supports issues that directly affect the professions of audiology and speech language pathology and consumers with hearing loss and communicative disorders. We were pleased to honor Representative Tim Brown as the 2016 OSHGAC Legislator of the Year. He was chosen for his work on HB 98, which names May 14th as Childhood Apraxia of Speech Awareness Day in Ohio. He sponsored the bill after meeting with a local family support group in his district. Representative Brown was contacted by constituents regarding this issue that was near and dear to their hearts. We honor Representative Brown because he is a leader who listens and finds appropriate and meaningful responses to the matters that are important to those he serves. The GAC recognizes that we have an ally in speech, language, hearing and communication issues in Representative Brown and we are very appreciative of that. OSHGAC is currently in the planning stages for a legislative event in 2017. The membership will be alerted as soon as details are confirmed. Your participation is necessary in order to affect policy changes in the state of Ohio. OSHGAC extends our thanks Oticon, Inc., Phonak Hearing Systems, Sivantos, Starkey, Inc. and Wide for their continued sponsorship of this event and our colleagues who attended the reception and helped make this a successful event. OSSPEAC works collaboratively with other professional SLP and AuD organizations in Ohio, including the Ohio Academy of Audiology (OAA), the Ohio Council of Speech and Hearing Administrators (OCSHA), and the Ohio Speech-Language-Hearing Association to advocate for issues related to our professions and the clients we serve. This collaborative organization is the Ohio Speech and Hearing Governmental Affairs Coalition or OSHGAC. OSHGAC has hired a lobbying group, Governmental Policy Group GPG), to assist with accomplishing our advocacy goals. Kelly O’Reilly, the Director of Govermental Affairs for GPG, works closely with the OSHGAC to identify key issues, alert OSSPEAC to pertinent upcoming legislation, and develop action plans for responding to or initiating needed action. She also works to promote passage of or opposition to bills or amendments as directed by OSHGAC. The “White Paper” document available from this webpage provides information about the legislative issues that GAC is currently involved in. OSSPEAC’s representative to OSHGAC is Kirstin Marconi-Hutkay. Please contact Kirsten with your questions and concerns. GREAT TIPS FOR BEING AN ADVOCATE! Invite your legislator out to tour and visit your workplace or school. Invite them to see the irreplaceable and crucial services you provide to the development of our young people. Let them view, first hand, how we are preparing them to be fully functioning, beneficial, active and independent, members of the workplace and society! Check out the handy tipsheet for hosting your legislator! Click on “Members & Professionals” Menu (across the top of the screen). Select “Legislation & Advocacy” from the drop down menu. A new page will open with links for public/non-ASHA members and also for ASHA members to write letters. You can do it! Send a letter today!